A group of Oxford Saïd MBA students have won £15,000 to advance their startup, VRTU, which aims to tackle dementia with virtual reality (VR). 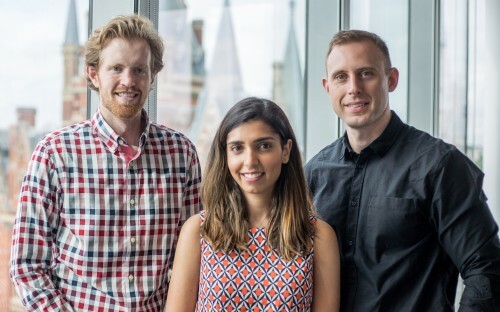 Oxford MBAs Arfa Rehman (CEO), Scott Gorman (CTO) and Christopher Larson (CMO) founded VRTU, a healthcare startup that uses VR to help dementia patients, in 2017. The Oxford team bagged the cash at the fifth annual Skoll Venture Awards in June. The scheme provides funding to current Oxford Saïd students and alumni who have developed a social impact-focused venture. The trio hit on the idea after seeing first-hand the effects of dementia on loved ones. VRTU works by using simulated time-travel therapy through story-based VR content. “Our team has grandparents who suffer from dementia and have experienced the distance that you can feel from loved ones as a result,” said Arfa. “We work closely with people in care homes who suffer from dementia and use VR as an immersive tool to overcome that distance, hep people communicate better, and bring back positive memories.” She added that research has shown that this form of therapy can positively improve quality of life and cognitive function. The Skoll Venture Awards have supplied VRTU with catalytic funding, but the business school will also accompany the startup as it progresses. “Most of our work has been self-financed so far,” Arfa said. “This is our first big grant and we will use the money to propel our product development.” VRTU hopes to launch by the end of 2017. The co-founders finish their MBAs in September.